Winner of more than 200 “BestOf” awards –including the 2016 BAFTA and 2016 D.I.C.E. 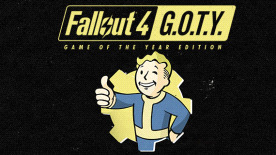 Game of the Year – Fallout 4 is the studio’s most ambitious game yet. As the sole survivor of Vault 111, you enter a world destroyed by nuclear war. Every second is a fight for survival, and every choice is yours. Only you can rebuild and determine the fate of the Wasteland. Freedom and Liberty Do whatever you want in a massive open world with hundreds of locations, characters, and quests. Join multiple factions vying for power or go it alone, the choices are all yours. You're Special Be whoever you want with the S.P.E.C.I.A.L. character system. From a Power Armored soldier to the charismatic smooth talker, you can choose from hundreds of Perks and develop your own playstyle. Super Deluxe Pixels An all-new next generation graphics and lighting engine brings to life the world of Fallout like never before. From the blasted forests of the Commonwealth to the ruins of Boston, every location is packed with dynamic detail. Automatron!The mysterious Mechanist has unleashed a horde of evil robots into the Commonwealth, including the devious Robobrain. Hunt them down and harvest their parts to build and mod your own custom robot companions. Choose from hundreds of mods; mixing limbs, armor, abilities, and weapons like the all-new lightning chain gun. Even customize their paint schemes and choose their voices! Far Harbor A new case from Valentine’s Detective Agency leads you on a search for a young woman and a secret colony of synths. Travel off the coast of Maine to the mysterious island of Far Harbor, where higher levels of radiation have created a more feral world. Navigate through the growing conflict between the synths, the Children of Atom, and the local townspeople. Will you work towards bringing peace to Far Harbor, and at what cost? Far Harbor features the largest landmass for an add-on that we’ve ever created, filled with new faction quests, settlements, lethal creatures and dungeons. Become morepowerful with new, higher-level armor and weapons. The choices are all yours. Contraptions Workshop! Machines that sort! Machines that build! Machines that combine! With Fallout 4 Contraptions, use conveyer belts, scaffolding kits, track kits, even logicgates to construct crazy and complex gadgets to improve your Wasteland settlements. The Contraptions Workshop also includes all-new features like elevators, greenhouse kits, warehouse kits, fireworks, armor racks and more! Vault-Tec Workshop! Build a brighter future underground with the all-new Vault-Tec Workshop. Create a massive Vault and attract new Dwellers using pre-war industrial kits complete with retro-nostalgic furniture, lighting, and art. And like every good Overseer, run Vault-Tec approved experiments on your Dwellers to learn what makes an ideal citizen. Vault-Tec has given you the tools, the rest is up to you! Nuka-World! Take a trip to Nuka-World, a vast amusement park now a lawless city of Raiders. Explore an all-new region with an open wasteland and park zones like Safari Adventure, Dry Rock Gulch, Kiddie Kingdom, and the Galactic Zone. Lead lethal gangs of Raiders and use them to conquer settlements, bending the Commonwealth to your will. Nuka-World features new quests, Raiders, weapons, creatures, and more. Enjoy the ride! © 2015 BETHESDA SOFTWORKS LLC, A ZENIMAX MEDIA COMPANY. BETHESDA, BETHESDA SOFTWORKS, BETHESDA GAME STUDIOS, ZENIMAX AND RELATED LOGOS ARE REGISTERED TRADEMARKS OR TRADEMARKS OF ZENIMAX MEDIA INC. IN THE U.S. AND/OR OTHER COUNTRIES. ALL OTHER TRADEMARKS OR TRADE NAMES ARE THE PROPERTY OF THEIR RESPECTIVE OWNERS. ALL RIGHTS RESERVED.